art and life: GUEST DESIGNING at OUAS and case file #157 ready to solve . GUEST DESIGNING at OUAS and case file #157 ready to solve . A challenge site with sketches and is all about journaling the journey of life. I am loving the softness and colors of this new range and thoroughly loved working with them . 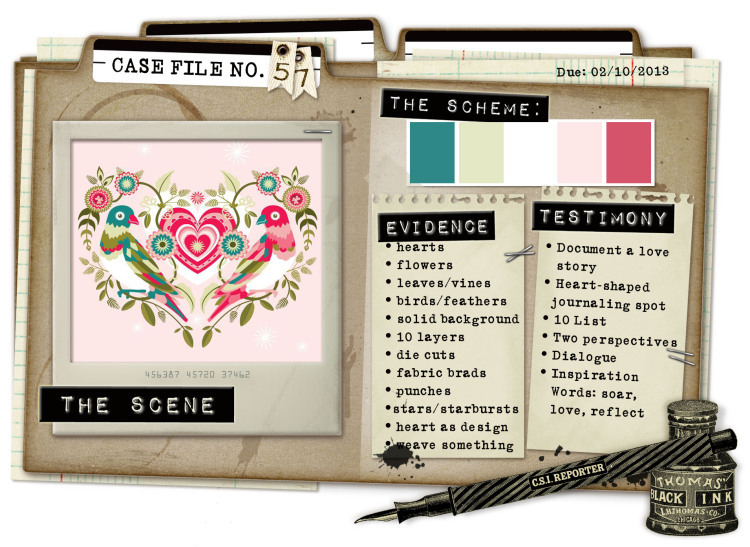 This layout is based on a divine sketch created by Nadia Cannizzo, the founder of OUAS. My page came together so quickly and is deceivingly very simple . WELCOME to February's challenge. We have some FANTASTIC inspiration for you this month. The super cool Design Team from our main sponsor this month, Meg's Garden, has played along with our challenge and what wonderful examples they have created. Thank you girls and thank you Meg's Garden for being our sponsor!! The month of February is the month we celebrate St Valentine's Day here in Australia and in many parts of the world. Love takes on many forms..relationship love, parental love etc etc. So let's think about what the above quote can mean and how you can interpret it on a layout. You are free to scrap about any kind of love you wish however you like based on the following sketch. I created the splashes of ink with Tim Holtz shabby shutters stain. Mount the photo, add file labels around edge . Proceed by adding a border of flower clusters/ rosette and hearts framing the photo . I used the delightful Buds of May paper for the circle and the stacked hearts. The diecut file labels, honeycomb shapes and leaves are created by using a combination of both A summers day and Buds of May. The two strips at the bottom of the page are random left over pieces . These collections are perfect for mixing and matching . Tim Holtz rosette die cut and stain, Dusty Attic chipboard, Imaginarium designs chipboard, Green Tara blooms, Spellbinders nestabilities/ heart diecuts, vintage brads, Kaiser stamp and resin blossoms, white/green bazzill . looking for the blue/green ?? here it is . sometimes I use only a small portion of one of the colors . hearts, flowers, leaves, die-cuts, punches, solid background, raspberry paper . Really, Heather, if they sold paper with your doodling on it, I would buy it! The giant LOVE stamp is Kaisercraft? because that's a really neat "font"
Heather, once again these are absolutely brilliant! I love all the beautiful details, especially those sweet layered hearts!! wow I'm in awe of these beautiful creations. Love the photos and all the little details you added on these 2 layouts!! *sigh* these are gorgeous!! I loveeeeeeeee the colors, the layers and loving those precious photos!!!! 2 Gorgeous creations Heather.......every little detail is just perfect, you are a real Artist. I am always in awe of your background work.....stamping, misting, inking...then there's the texture, layers and stitching. Your photos, colours and embellishments are just Beautiful. Wow, two absolutely amazing lay-outs! 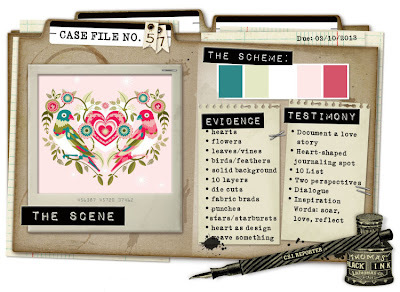 You have such a gorgeous style of scrapbooking. I couldn't agree more with Romy above, both are truly stunning! Have to say I love the sketch of the first oe lots, - and what you did with it is nothing short of amazing!! Ah these are beautiful Heather.. really really beautiful! Beautiful work, and truly stunning designs Heather. I love all the details and how you put the colours together. Would you ever think of doing an online course/workshop for us admirers ? These are both so pretty! Love the greens in the first....so dreamy. Your take on the CSI challenge is fantasic! Wow! Yor works are fabulous Heather! I just adore your interpretation of the challenge Heather - your work always stands out from the crowd. Such gorgeous layouts Heather! Both are just stunning! You certainly have such a way with paper! Awesome! Both of these are so gorgeous! I am so glad to have found your blog!!! Heather......I was totally blown away when I saw your page for OUAS, it is just jawdroppingly gorgeous! I love the colors and those elements are just sheer perfection. You use color so beautifully! I love this!!!!! These are stunning Heather! I know I've said it before but the way you work a muted colour palette is amazing! Such beautiful pages! Totally gorgeous! Beautiful pages, both of them. You have such an eye for details, and the mix of tecniques is amazing. TFS! Not much left for me to say either, just chiming in loudly with all the other ladies! you ARE a true artist my love! each and one of your pages deserves to be published, framed and put up for everyone to see and admire. You are in a league of your own, the Heather League. I admire you so, truly and deeply! thank you for all the inspiration, beauty and generosity in sharing! Mwah!